Prior to my current focus on music technology, I founded & led NetProspex, a data technology company in the headwinds of recession in a noisy & very competitive marketplace. Our vision was that accurate marketing data would be a gating-factor to success for companies deploying state-of-the-art marketing technologies. That value proposition was essentially & unglamorously janitorial -- making sure data is accurate so that data is usable in the marketing technology stack & can deliver the sort of insights promised by the Big Data movement. Our scaleable platform for maintaining the hygiene of marketing data led to the sale of the company to Dun & Bradstreet in 2015 & provided a significant return for our investors. From the get-go, we knew that success required more than building a better product, it required us to say our message in a different way to stand out. The chart above shows year-on year revenue growth, awards won & venture capital rounds. We started NetProspex with less than $400k of angel funding in 2007. With snub-nosed capital efficiency, we doubled sales each year & by 2010, analyst firm Outsell Inc. named NetProspex "...one of 30 companies to watch in the coming decade". The NetProspex home page with minimal text, clear icon use and a design that carries the brand colors & design elements of our office into the digital customer experience. Boiling it down is harder than it looks. But in a few words and visuals you should be able to convey your value proposition. The introduction of a character into the scene below reflects one of our buyer personas - the demand generation marketer. This provides the emotional connection & answers the question of "what does it do for me?" We used this visual to create a one-minute video explaining how our product helps our customer. Our CEO, Mike Bird came up with the idea of three cogs to show how the content created by today's marketers is delivered to the right-person at the right-time using data & marketing automation technology. This idea of a connectivity engine is a useful way to envisage marketing's organizational processes. It also allowed us to introduce the idea that data is used in multiple touch points such as client registrations, market segmentation, lead scoring, campaigns & targeting. Data is often old, incomplete or wrong. Dirty data is like dirty fuel, slowing things down & creating friction. In a KPI-driven world, cleaning & enhancing data is equivalent to both oil change & fuel additive for an engine always fine-tuned to maximize sales. Often companies in the same sector use the same visual metaphors & similar stock photos to describe what they do. If you are a leader in a field, why follow? We found that using artists like installation artist Christina Zwart allowed us new visual metaphors critical to making a shift in how customers perceived the organization & creating distance from the competition. Below are 4 banner graphics that Christina created that speak more authentically than any stock photo & which were nowhere near how our competitors looked. Above: the banner for the product page which shows chaos on the left turning into order on the right. The sticky colored people is a re-use an idea for a piece in our office space [see next section]. Above: we wanted to depict how our repeat customers feel about about our service in a unique and colorful way. Above: another simple yet creative idea to depict our relationship with our partners. Above: the banner graphic for the company page which again re-uses another idea from our Boston office where we have a wall of magnetic photos of our employees [see below]. Above top row: Christina Zwart's piece in our Boston office that depicts the amount of data we manage that could be updated regularly. Made of sticky people figures, we re-used this idea to create our product page banner on our website. Middle row: Recent employees are coralled for a photoshoot of thumbs-up for our customer web page banner. Bottom row: With our explosive growth, the need for us all to know everyone's names was really important. We asked Christina to come up with an idea to provide a fun, open directory. Each new employee is photographed & printed on magnetic photo paper to stick to a wall of magnetic black paint. again, we re-used these photos for our company page banner on the right. We were fortunate to hire some incredibly talented people who helped us built a vibrant culture that transmitted to our customers & reinforced the authenticity of our approach. 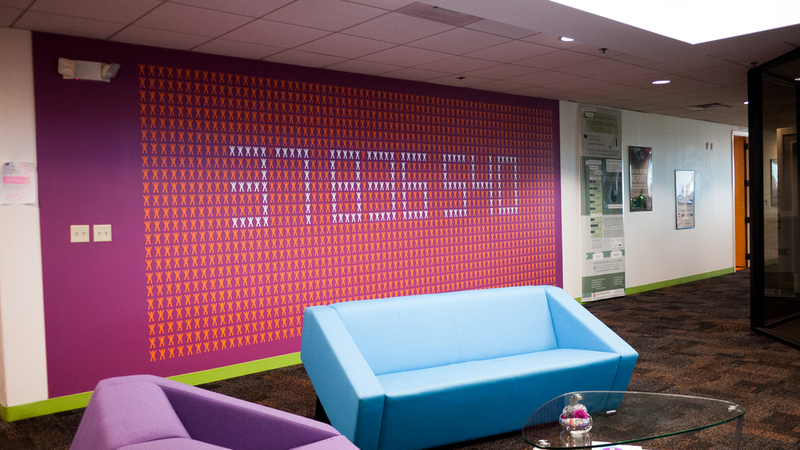 The NetProspex office in Boston is a colorful, vibrant place where visitors are excited by the space & the energy of the people working there.